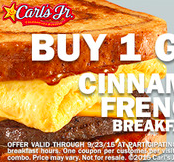 Currently, you can print a coupon valid for a Buy 1 Get 1 FREE Cinnamon Swirl French Toast Breakfast Sandwich from Carl's Jr. or Hardee's! If you live near a Hardee's, you'll want to print your coupon from here. These coupons are valid through September 23rd!